Special Promotional Parts Offers – Stock up today whilst prices are low! With Spring knocking on the door and the clocks soon to go forward, we have some very special promotional parts offers for you. These offers which are for March and April 2019 only, include discounted prices on a range of products including Hayter Pedestrian Lawn Mowers, Husqvarna chainsaws and brushcutters and Case IH filters. This handy pack of hand wipes is useful in and around the workshop or for keeping in your vehicle to help sanitise and remove stubborn dirt and leave them fresh and clean. 150 wipes per container with re-sealable lid to keep them fresh. Keep on top of many jobs around the home and farm with this quality 16 litre Knapsack sprayer that includes lance and adjustable nozzle. Ideal for irrigating gardens, draining cellars/basements and powering waterfalls/fountains. This quality Draper Submersible Pump has a ceramic shaft for long life, thermal overload protection and float switch which automatically cuts pump off when water level has dropped. Supplied with 19mm diameter hose adaptor and 10Mtr (approx.) cable. 120L/min and 230V with 6 metre lift and float switch (200W). Buy any genuine Case IH filters and get 10% discount. Only genuine Case IH filters are recommended for your Case IH machines to keep them running smoothly and give longer service life. This high performance petrol lawn mower achieves the classic stripes in any garden, and the compact design and ease of manoeuvring make the Harrier 41 ideal for small to medium gardens. This sturdy lawn mower features four swinging blades which are designed to deal with rough grass and and provides a neat finish to semi formal lawn areas where grass collection is not required. The Husqvarna 129RJ Brushcutter is professional quality and features a powerful 27cc petrol engine and comes with trimmer head and grass blade plus a combination guard so you don’t have to switch guard. It is easy to start thanks to Smart Start®, intuitive controls and the automatic stop return switch – a feature that automatically resets to the ON position for trouble-free starting. The Husqvarna 435 petrol chainsaw is lightweight and easy to maneuver and features Husqvarna’s unique Smart Start which means that operators are required to produce up to 40% less force on the pull cord to start the chainsaws engine. Featuring an X-Torq® petrol chainsaw engine it improves fuel consumption up to 20% and reduces exhaust emission by up to 75% when compared to other saws on the market. Equipped with a fuel pump and Auto return stop switch to make the chainsaw easy to start, it comes with an interchangeable 15″ chainsaw bar as standard. 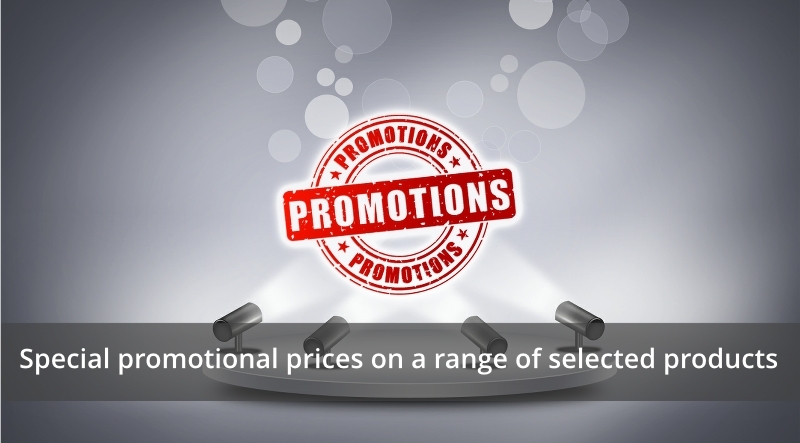 To take advantage of these fantastic Special Promotional Parts Offers, contact our parts department today, as at these great prices, we don’t expect stocks to last very long. You can also see these latest offers by clicking on the link below. All prices quoted exclude VAT at the prevailing rate and prices shown are whilst stocks last and only during March and April 2019. We reserve the right to withdraw any offer at any time during the promotional period. Terms and conditions apply.